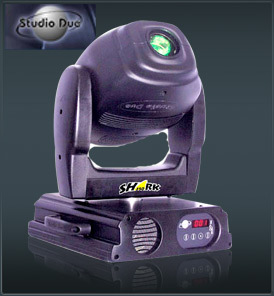 The development of the new range of motorised spots continues and Studio Due presents the Studio Due Shark 250: a moving head that, manufactured in plastic and aluminium, combines a modern design to a considerable lightness and reliability. This is achieved by using many pressed parts that considerably reduce the tolerance and the possibilities of mistakes during the assembling. All the production run is carried on in the company – design, plate working, dies, electronics development – which enables us to manufacture a modern and reliable fixture, quoted at a very competitive price. Last but not least, the switching system of the electronics makes it possible to install inside the fixture one auto transformer that – upon request – permits the feeding at 100V 50 Hz or 177V 60Hz, with only 600 gr extra weight. 350VA , PFC built-in cosØ0.9.